For the second year in a row, students from colleges and universities across the country are spending their summer at The University of Toledo for undergraduate research experience and mentoring. Alex Weeden, a Wisconsin native with a passion for water quality, is preparing to enter her senior year at Hanover College in Indiana by working under the direction of a scientist in the UT Department of Environmental Sciences. 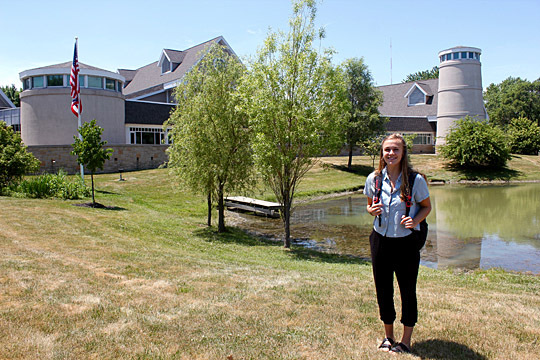 Alex Weeden, a senior at Hanover College, stood outside the Lake Erie Center, where she is spending nine weeks in the Research Experiences for Undergraduates program sponsored by the National Science Foundation. “I am researching the methods of toxin detection in the lake and trying to make that method more accurate,” Weeden said. The National Science Foundation sponsors the Research Experiences for Undergraduates program. 315 students from 83 colleges and universities applied for less than a dozen slots in the Research Experiences for Undergraduates program. 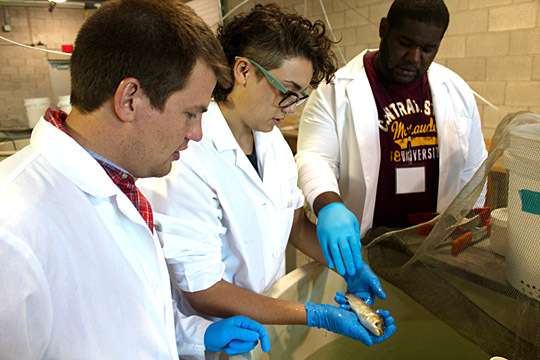 Nate Marshall, a UT graduate student and a mentor for the National Science Foundation Research Experiences for Undergraduates program, left, watched as Hannah Scheppler, a senior at Bowling Green State University, center, and Jochannan Mitchell, a junior at Central State University, examined a juvenile grass carp, a type of invasive Asian carp, at the Lake Erie Center. “Our program targets minority students, veterans, first-generation college students, and those that lack undergraduate research opportunities on their home campuses,” Stepien said. 11 students, including one who is returning for a second year, are each paid a $5,000 stipend. The program also pays for the students to stay in residence halls on Main Campus and their travel to and from Toledo. Dr. Song Qian, UT assistant professor of environmental science, is Weeden’s faculty mentor. Weeden is conducting experiments for Qian’s project to develop a new, more reliable method to measure the algal bloom toxin called microcystin in drinking water. Participating undergraduate students attend the University of South Carolina at Columbia, the University of Colorado at Colorado Springs, Bowling Green State University, Central State University, Cheyney University of Pennsylvania, Iowa State University, Pitzer College, Hanover College and UT. This entry was posted on Wednesday, July 6th, 2016 at 3:08 am and is filed under Events, Natural Sciences and Mathematics, News, Research, UToday .